Earth Day: Pew Research poll shows how little Americans care about the planet. 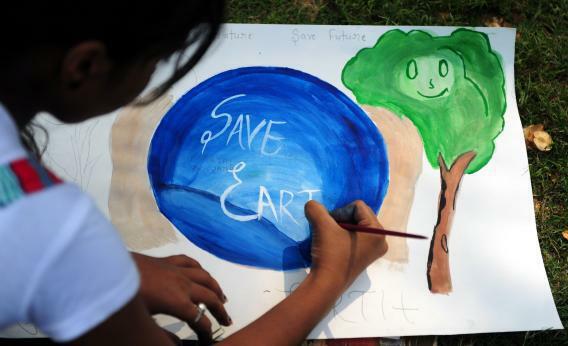 An Indian child paints during an awareness event organized by the Aakalpan Artist Society commemorating Earth Day in Allahabad. Environmentalists like to think that the public is in their corner—that it’s only the pernicious influence of Big Oil and Big Coal that keeps Congress from passing a carbon tax or Obama from nixing the Keystone Pipeline. They’re right that most voters care about the planet, insofar as they’d prefer not to see it trashed, all other things being equal. But all other things aren’t equal. And a lot of those other things rate much higher on Americans’ priority list. Today Pew Research is highlighting a recent poll that shows that 52 percent of Americans believe protecting the environment should be “a top priority for the president and Congress in 2013.” That’s up 11 percentage points from 2009, though still down from a high of 57 percent in 2006 and 2007. Those numbers all sound pretty good until you realize that the key word there is “a,” as in, not “the.” In fact, the poll lists 18 possible priorities, ranked by the percentage of respondents who think each one should be at or near the top of the nation’s priority list. “Strengthening nation’s economy” comes in first, followed by “improving job situation” and “reducing budget deficit.” And if “growing the GDP,” “improving the nation’s financial outlook,” and “putting more Benjamins in people’s pockets” had been options in this survey, I have no doubt they would have rounded out the top six. What is the nation’s energy problem, exactly? Oh well. Whatever it is, it’s got to be more pressing than global warming, right?